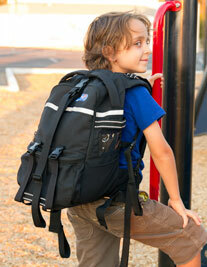 The word SIPE on the backpack means Sensory Integration Pack Enhancement. We choose this for a couple of reasons. The first is that the pack is being used for reasons other than mobility and gait assistance which was our original intent for the backpack. The second is the fact that the Schools Insurance Program for Employees (SIPE) has provided all the support and funding to make this product possible for our member school districts to use in their classrooms. The SIPE backpack is equipped with multiple stabilizing handles in key locations to provide a firm grip in those situations where additional controlor support of the child is important. The Schools Insurance Program for Employees was granted a patent by the USPTO for our specialized backpack on October 3, 2017. The patent abstract states: Disclosed is a backpack having a plurality of stabilizing handles. The handles are of fixed dimension and are distributed around the outside of the main compartment of the backpack to provide a number of places for a caregiver to grip when assisting a wearer of the backpack walk. A rear side of the main compartment may have four handles, a front side of the backpack may have 6 handles, and side panels of the backpack may have 4 handles. A lead may optionally be attached to the D-ring on the rear side of the backpack. Providing numerous grip handles around the backpack enhances the ability of the caregiver to provide spotting support, without stigmatizing the user from the use of a harness or other such assistive device. The SIPE special education backpack was designed with two thoughts in mind: to help children with special needs towards independence and prevent injuries to teachers and instructional assistants caring for these children. Our pack is highly beneficial for some children with special needs allowing for more independence and helps them accomplish their daily educational goals. Wearing the pack may help integrate sensory information and thus promote increased concentration and organization, enabling them to focus on accomplishing important tasks. These backpacks were designed and developed with the assistance of the special education programs in the Public Schools of San Luis Obispo County, California. Originally created as part of a risk management strategy to prevent employee injuries, the packs are helping certain students with special needs and other disabilities. Visually, the pack is really not all that different from any other backpack you might see at a school site, but it includes special features to help occupational therapists, educators, and family members care for and enhance the lives of children with special needs. The SIPE backpack was designed and is currently being manufactured in San Luis Obispo, CA by a local pattern maker. It is our desire to manufacture this product in the United States to support and promote local businesses and their communities.